Food banks become an essential lifeline for so many in need. 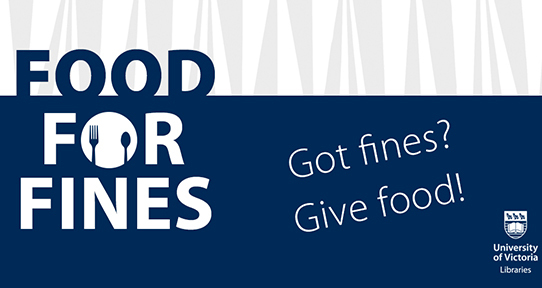 The annual Food for Fines campaign by UVic Libraries offers relief from library fines in exchange for non-perishable food items, which are then donated to the Mustard Seed Food Bank and the UVic Students’ Society Food Bank & Free Store. Items most needed include rice, pasta, baby food, peanut butter, canned beans and fish, as well as toothbrushes, toothpaste and soap. Fines will be discounted by $3 for every non-perishable food item or personal item (up to a maximum of $20). Library users may also pay for their fines (up to $20) as a donation to Mustard Seed.